Canada, 1763 (Jul. 25) Quebec, Canada to Montauban, France, folded letter datelined "Quebec le 25: 7: 1763", back flap with endorsement "Recommandee au Monsieur Perrault Por Son Tres humble Serviteur, Berthelot" entered mails in France with manuscript "4S" sols due; minor edge tear and wear, fresh and Very Fine. 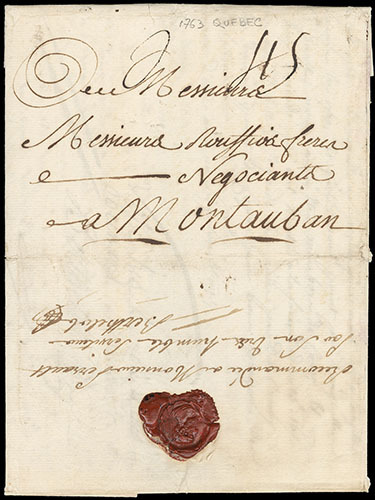 A RARE EXAMPLE OF MAIL FROM CANADA TO FRANCE DURING THE INTERIM PERIOD BETWEEN BRITISH CONQUEST OF 1759-60 AND THE ESTABLISHMENT OF BRITISH POSTAL SERVICES IN 1763. 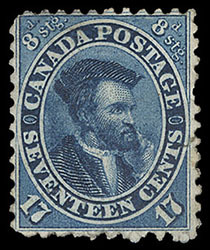 After the British conquest in 1759-60 until the establishment of British postal services in 1763, there were no organized postal services in Canada. As a result, this cover was carried by private vessel to France. New French postal charges effective July 8, 1759 were 4 sols maritime postage on letters from Canada. Canada, 1859-64, Pictorials, 1¢-17¢ issue, set of 6 denominations, most without gum, strong to rich colors, few small flaws, otherwise Fine. Scott No. 14-15, 17-20 $4,350. 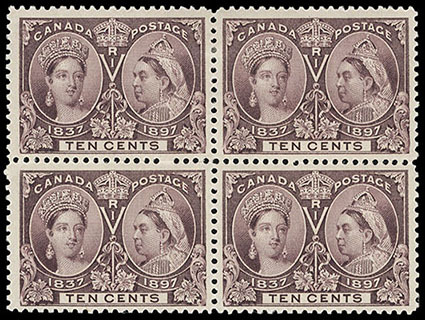 Canada, 1868-76 Large Queens complete, set of 10 values, most without gum, strong to rich colors, few small flaws, otherwise F.-V.F. 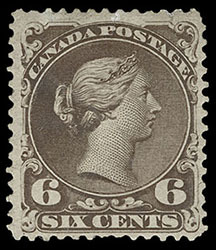 Canada, 1868, Large Queen, 6¢ dark brown, watermarked, showing full "M" watermark, light target cancel, rich color, couple small thins, Fine appearance, very scarce. 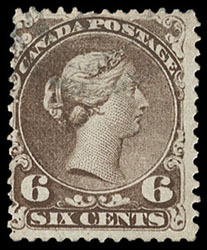 Canada, 1870-97 Small Queens complete, 15 stamps including 2¢ & 8¢ values in shades, o.g., one 8¢ without gum, few small flaws, otherwise F.-V.F. 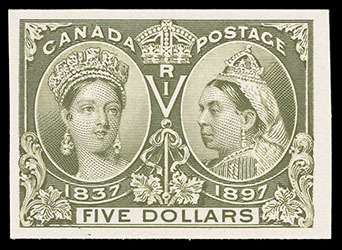 Canada, 1897, ½¢-$5 Queen Victoria Jubilee complete, plate proofs on India, on card, all with ample to large margins, rich colors throughout, a Very Fine and choice set, only 400 sets can ever exist. Unitrade No. 50P-65P C$7,000 ($5,270). Scott No. 50P3-65P3 Estimate $1,000 - 1,500. 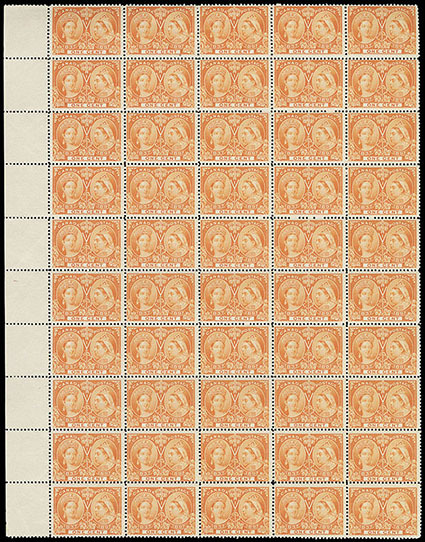 Canada, 1897, Queen Victoria Jubilee, 1¢ orange, left margin pane of 50, o.g., two stamps lightly hinged, others never hinged, rich color, diagonal crease at top left affecting seven stamps, otherwise F.-V.F. 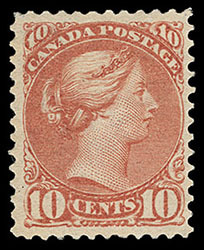 Canada, 1897, Queen Victoria Jubilee, 10¢ brown violet, block of 4, o.g., top stamps hinge remnant, bottom stamps never hinged, wide margins and rich color, Very Fine. 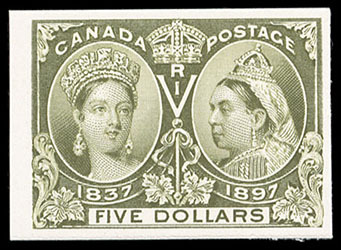 Canada, 1897, Queen Victoria Jubilee, 50¢, $3-$5, plate proofs, India on card, wide margins and rich colors, Very Fine. Scott No. 60P, 63P-65P. Unitrade No. 60P, 63P-65P C$2,775 ($2,090). 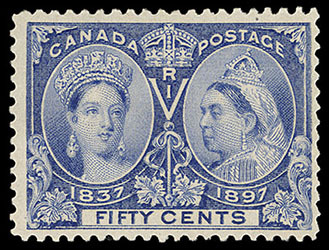 Canada, 1897, Queen Victoria Jubilee, 50¢ ultramarine, o.g., never hinged, rich color, F.-V.F.